Have you ever wondered how your food choices affect the environment? Fancy exploring data on nutrition and greenhouse gas emissions and coming up with new ideas for changing food choices? There are only a few places left for the next GGDOT Hacknight in Manchester, where academics, data wranglers and tech experts will come together to explore different datasets which combine nutrition information and information on greenhouse gas emissions from food production – all while eating pizza, of course! 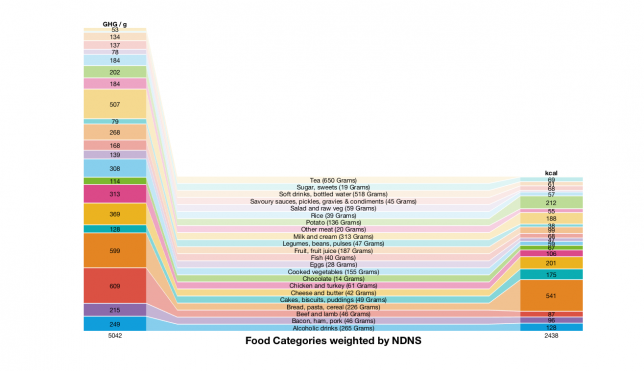 The Hacknights use some data that’s in the UK Data Service collection as well as a newly-compiled database of food-related emissions values created at the University of Aberdeen. The UK Data Service is very excited to be supporting the GGDOT Hacknights. We’re going to come along and tweet about the event. It’ll be a great chance to talk to people and see what they’re doing and then feature a series of blogs about some of the exciting outcomes. We like this graphic about greenhouse gas emissions and calories from a previous Hacknight and are hoping to see even more exciting ideas coming out this event! The next GGDOT Hacknight takes place in Manchester on Thursday 20th September 6pm-9pm. Book your place here. Places are going fast, but if you do miss this one, there will be two more in different northern cities in October and November 2018. If you are interested in the background of the GGDOT Hacknights, please read this blog post on the Food Climate Research Network (FCRN) site. And watch the blog and Twitter to find out more about the event!